This past weekend was yet another dismal failure at the North American boxoffice with revenues off a staggering 45% versus the same week last year. The remainder of August also looks bleak and may not improve until the fall when the plethora of titles vying for Academy votes descend upon multiplexes and art cinemas alike. Industry pundits blame everything from the explosion of sequels and remakes to moviegoers’ increasingly short attention spans to the evil empires of Netflix and Amazon for the attendance plummet. But then a funny thing happened in 1939 in Hollywood. Studios finally got the memo that film could both entertain and serve as an art form as well. They learned that moviegoers wanted more from their movie ticket than bad special effects and animal adventure serials. From 1931-1938 only one year (1933) had more than one title that would ultimately end up on the AFI Top 100 list. Even the Best Picture winners of the 1930’s were a lackluster group, to be sure. Movies like “Cimarron”, “Cavalcade, “The Great Ziegfeld” and “The Life of Emile Zola” won the coveted Best Picture prize during that decade, none of which can honestly be described as masterful moviemaking. The five highest grossing movies of 1937, for example, were “Snow White”, “The Good Earth”, “100 Men and One Girl”, “Topper” and “Wee Willie Winkle”. Having been in the movie industry all my life (including 30 years in Distribution as well as being constantly dragged to my dad’s chain of movie theaters when I was a kid in New England) and being what I would consider a film devotee, I can honestly say that I’ve seen a grand total of one of those films and that one was when I was 6 years old. 1938 didn’t fare much better as “Alexander’s Ragtime Band” copped the top spot at the boxoffice, followed by “Test Pilot”. Again, not exactly the gold standard of filmmaking, and even that year’s Best Picture winner, “The Life of Emile Zola”, is generally considered one of the least worthy Oscar winners of all time. Then something changed in 1939. The concentration on lighthearted fare shifted at Hollywood studios to a more grand-scale, epic focus, propelled by masterful storytelling and exceptional directing by some of the greatest helmers who ever sat in a Director’s chair. Consider the stunning list of films released in that year. 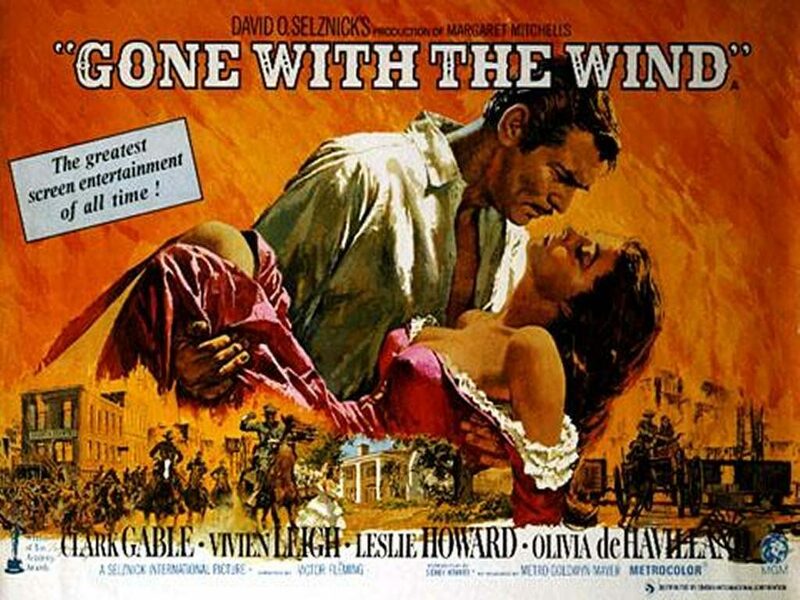 When adjusted for inflation, “Gone With the Wind” remains the highest grossing film of all time worldwide. The movie was, and remains, a cultural phenomenon and garnered 8 Academy Awards including Best Picture and the first award for an African American in the history of the Oscars when Hattie McDaniel won for Best Supporting Actress. 1939 was also the year that Robert Donat, probably best known at that time for starring in the Hitchcock classic, “The 39 Steps”, pulled an absolute stunner by winning Best Actor for “Goodbye, Mr. Chips”, over the likes of Lawrence Olivier, Clark Gable, Jimmy Stewart and Mickey Rooney. Let that sink in for the moment. The film is one of the most underappreciated gems of 20th Century filmmaking, featuring a wonderfully stoic performance by Donat and a stunning-in-its-simplicity supporting turn by the also nominated Greer Garson. It is a moving tale of a kindly teacher’s journey through life in a private English boys school. If for some unknown reason you’ve never seen the film, do so. Now. 1939 is also famous for films such as “Mr. 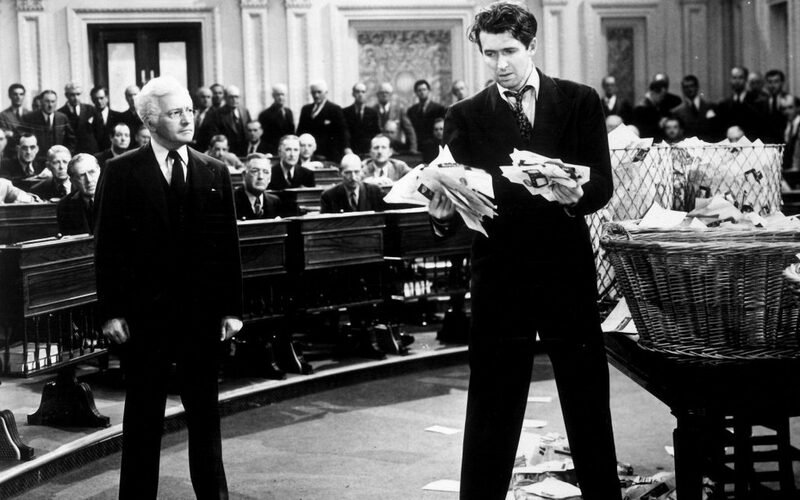 Smith Goes to Washington”, “Ninotchka”, with the great Greta Garbo, John Wayne’s first major motion picture starring role in John Ford’s “Stagecoach”, Lawrence Olivier in “Wuthering Heights”, Bette Davis in “Dark Victory”, Lewis Milestone’s adaptation of John Steinbeck’s “Of Mice and Men”, the classic romantic drama “Love Affair”, “The Hunchback of Notre Dame”, “Gunga Din”, Marlene Deitrich and James Stewart in “Destry Rides Again”, “Only Angels Have Wings” with Cary Grant and Jean Arthur, and the debut of Basil Rathbone as one of the most famous characters in modern literary history, Sherlock Holmes, in “The Hound of the Baskervilles”. Oh and lest we forget, a little film that almost single-handedly transformed modern moviemaking in “The Wizard of Oz”, with the legendary Judy Garland. 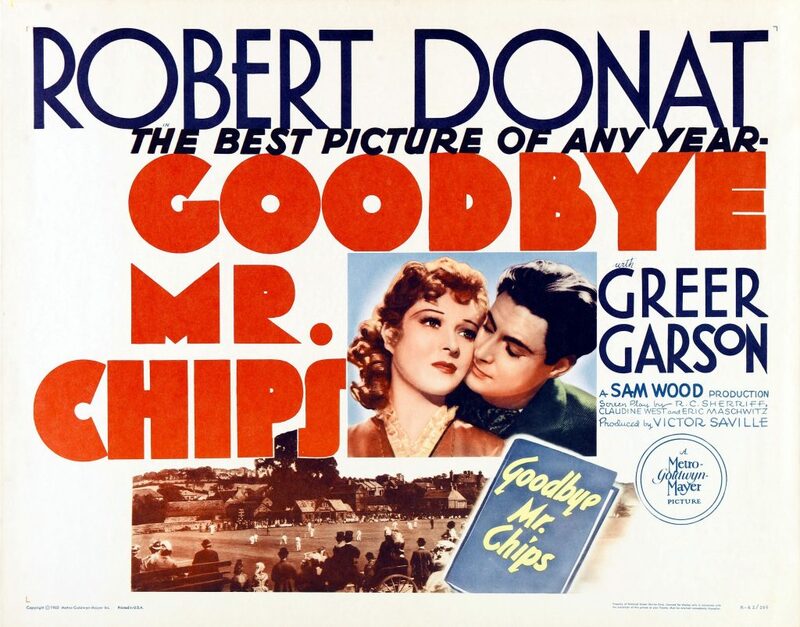 “Goodbye, Mr. Chips” won an Oscar for Robert Donat in 1939. What do the above titles all have in common? Sequels? No. Cheesy special effects? Heck, no. Lazy storytelling? Definitely not. They are all high quality, passionately crafted films that serve as both art and entertainment. And THAT is what is lacking in today’s Hollywood, especially at the major studios. A few years back several of the studios proclaimed they were only going to make tentpole films, which on paper is probably a lovely business model. But unfortunately in their rush to find the newest franchise or to keep the current ones afloat they have made too many, too soon and focused their efforts on securing prime release dates years in the future and betting on new (and less expensive) directors and screenwriters, rather than crafting a quality film that both audiences and critics would embrace. Think of how many famous directors have so far released films in 2017. Christopher Nolan and Kathryn Bigelow come to mind. Yes, Spielberg has a film at Christmas and there are others but align that against the list of famous directors who released films in 1939. That list includes Frank Capra, Jean Renoir, Victor Fleming (who directed two films that year), John Ford (who actually directed three), Edmund Goulding (two films), Michael Curtiz (two films), George Cukor, Cecil B. DeMille, Howard Hawks and William Wyler, to name but a few. We need another 1939. And we need it now. Two main factors drove the moviegoing explosion of the late 30’s and early 40’s. First, World War II began and Americans needed an escape from the horrors of Europe and Asia. And secondly, Hollywood began combining larger than life stars with epic storytelling. In 1930 an astonishing 65% of American audiences went to the movies every week, largely due to the novelty of talkies. Throughout the 30’s that number began to decline and sat at 41% in 1936. But thanks to the aforementioned two major factors, moviegoing in the US vaulted back up to 61% of the population attending at least one movie a week. Just to put that in perspective, 5% of today’s population attends a movie a week. How times have changed. And if you think the boxoffice boom of 1939 and the early 40s was due solely to it being wartime and moviegoers needing an “escape”, consider the list of heavy, serious fare in 1939, films such as “Wuthering Heights”, “Of Mice and Men”, “Gone With the Wind”, “Only Angels Have Wings” and “Dark Victory” quickly come to mind. The early 1940’s were no less light and airy. How have the studios shunned quality filmmaking? Look no further than recent Best Picture winners. Since 2007, only one major studio release (“Argo” in 2012) has won the Best Picture Oscar. The rest have been from specialty, art film distributors. The majors have unfortunately concentrated on mechanical robots, comic book superheroes and mind numbing comedies that go for the quick money grab and go. Just like in 1939, Hollywood needs a concerted return to quality filmmaking. It needs to focus on directors who specialize in storytelling rather than producers who specialize in packaging explosions and special effects. If it doesn’t, it runs the risk of watching the percentage of the population who consider themselves regular moviegoers dip somewhere below those who consider themselves opera fans or interpretive dance aficionados. And once they lose the regular moviegoer it will be increasingly difficult to win them back, especially with the preponderance of other content sources available to them in today’s world. Tags: Hollywood, 2007 box office, 1939, "Gone With the Wind"